Volunteers are needed this Saturday to help with ongoing cleanup effort at the new Gurdwara site. To help out, please bring along shovels, brooms, gloves and wheelbarrows. As it’s an active construction site, you are requested to bring and use your safety gear and follow safe work practices. Volunteers must be over 18 years of age. Please contact Darshan Jassal Ji at 519-546-9456 and provide confirmation if you will be participating in the cleanup. We appreciate your support and look forward to seeing you on Saturday. We would like to thank all who attended the Sikh Flag Raising ceremony at the Guelph City Hall today. Visit the Media Gallery on the website to view the pictures and video from todays event. Every Sunday from 2:00PM to 3:30PM, free Math’s classes are being conducted at the Gurdwara for students from grade 6 to grade 12. If interested in joining, please contact the Gurdwara. Please sign up at the Gurdwara if you would like to reserve a seat on the bus. We are excited to announce that renowned Katha Vachak, Giani Amrik Singh Ji, Chandigarh wale, will be present at Guelph Gurdwara this Sunday March 3rd. Also, during March break week, another renowned Sikh educator, Giani Gulzar Singh Ji will be present at the Gurdwara to engage with the youth by providing key insights into Sikhism. He will be conducting Katha in English and Punjabi. We look forward to your participation. Please pass message onto all family and friends. Sewa is available for this week. Please note: Committee members are going door to door in your neighborhood to ask for your support. Please open your home and hearts to help us raise immediate funds to pay for the ongoing construction costs. The costs for heating, flooring etc. are in progress. This is the Guru’s project and your contributions will bring this project to a success! This Friday will mark the 40th Day of Simran at the Guelph Gurdwara in Remembrance of the 40 Mukte. We are grateful to the Sangat who have attended the Simran and participated in the Langar sewa. It is with a heavy heart that we share the loss of Sardar Mohinder Singh Ji Furmah. We offer our heartfelt sympathies to Sardarni Ravinder Kaur Ji, son Richie, and the entire Furmah family for this difficult loss. Mohinder Singh arrived in Canada in 1972, and he, along with his family, have been active sewadars in the Guelph gurdwara and local community for over 45 years. They were amongst the first handful of Sikh families to arrive in Guelph. Mr. Furmah also recently served as a committee member on the Guelph Sikh Society board. We will miss his support and positive demeanor. Funeral and Antim Ardaas will be held on Sunday, February 3rd in Brampton. Please read below for further details to join with the family to pay final respects. Once again, we offer our deepest condolences to the Furmah family for their loss. May Waheguru give peace to the departed souls, Karnail Singh and Mohinder Singh, and provide fortitude to the families in dealing with their loss. 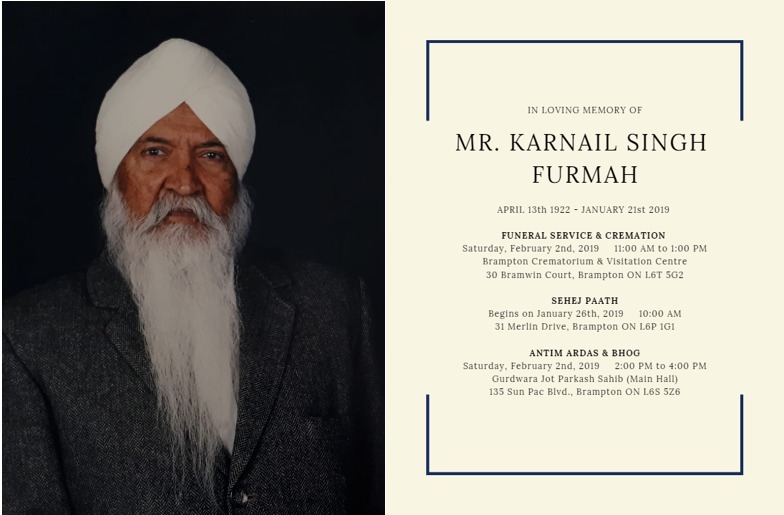 At this time, we share our sincerest condolences with Amarjit Singh Furmah and family on the passing of his dear father Sardar Karnail Singh Ji. We offer our heartfelt condolences to the entire family, and all relatives and friends. The Furmah family has been residents of Guelph for over 40 years and have been active participants in our gurdwara community. Please join with the family to pay respects, and to share in their loss. Funeral and Antim Ardaas will be held on Saturday February 2nd in Brampton. Please click this link (Karnail Singh Furmah) or read below for further details. Once again, our sincerest condolences to the family and may Waheguru give peace to the departed soul, and guidance and strength to the family to deal with their loss. In memory of the 40 Mukte – The 40 Liberated Ones, Guelph Gurdwara will be hosting evening Naam Simran for 40 days, starting tomorrow. Each day will be dedicated to honor the sacrifice made by the Mukte while defending Guru Gobind Singh Ji. Tomorrow also marks the beginning of month of Magh which is considered sacred and fortunate. During this month, all Sikhs are reminded to be humble, forgiving and kind to all beings. This is the time to take advantage of the benefits of meditation and Naam Simran, and also to pay homage to the sacrifice of the 40 Mukte. Langar will be served. Call the Gurdwara if you would like to book Sewa. Kirit Karo Naam Japo Vand Chhako. This Saturday, January 5th we celebrate the Gurpurab of Dhan Dhan Guru Gobind Singh Ji – Sahib-E-Kamaal! Guru Gobind Singh Ji: the 10th Jot of Guru Nanak Dev Ji, the distinguished poet and saint-soldier, the creator of Khalsa, the Sarbans Dani! You created the Panth and forwarded us the Guru Granth Sahib! Please join in remembering the remarkable legacy of our great Guru Gobind Singh Ji by listening to gurbani, remembering the history and taking part in service this weekend. We are a sacrifice to our Guru who sacrificed everything for us to live. We are blessed. Wow! Wow! Gobind Singh, himself is the Guru and the disciple. Please note at this time we have a surplus of: atta, sugar, salt, rice, daals and tea bags. We kindly request sangat ji to make a financial donation that can be used for supplies that are needed. Thank you for your co-operation. Your support is vital at this time to help us keep the construction on the new building moving forward. Don’t delay – donate today! This is the Guru’s project, and your contributions will bring this project to a success! Thank you.